I’ve had the bumper crop to end all bumper crops when it comes to my nasturtiums this year. 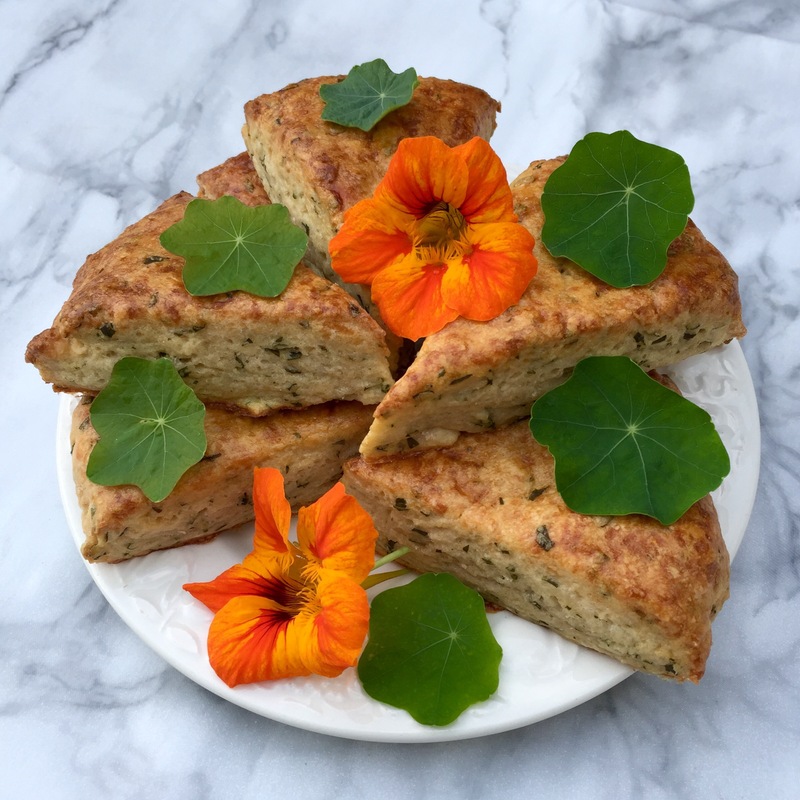 I’ve grown them from the seeds I got in this Gourmet Flower Kit by Plant Theatre – my Mum said she has never seen nasturtiums take the way mine have this year. Endless garnishing possibilities!!! Delicate, young nasturtium leaves make a really pretty, almost geometric, modern decoration for anything from a salad to a lamb roast. However, I thought I’d think a bit outside the box and use the leaves in some baking for their peppery flavour! 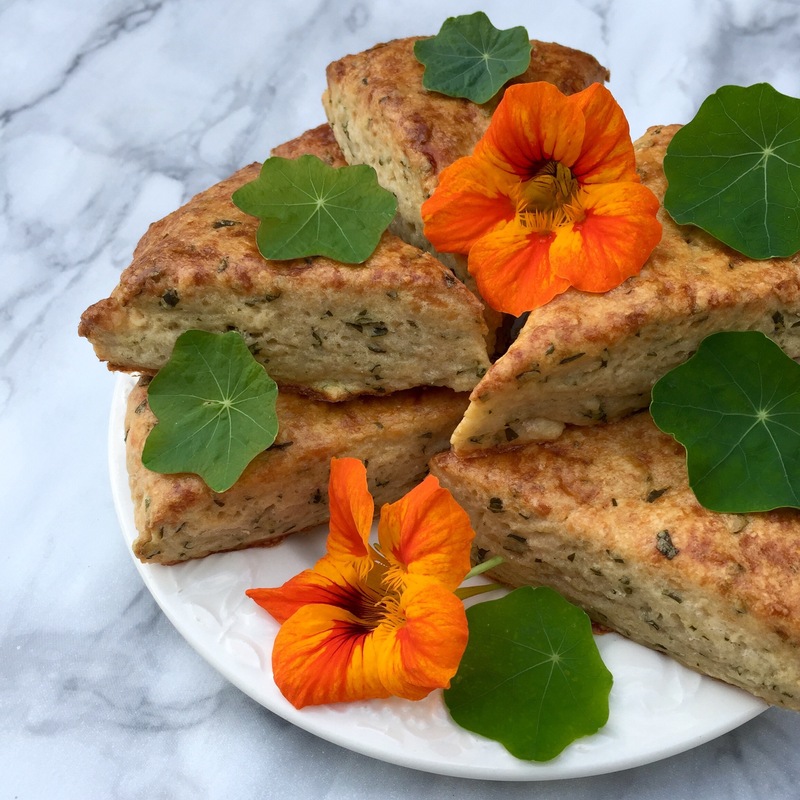 These nasturtium scones were a perfect way to hero that rocket-like flavour, and I added a hint of Parmesan as well to give it them real depth. I didn’t make your average neat, round scones that we might be used to in the U.K., but instead cut them into triangles from a big circle. This is a more American style of scone, but it makes so much sense. To get a delicious buttery, but fluffy scone you need to avoid over-working the dough. For a small-scale bake like this you would have to re-roll the dough each time you’d cut out all the circles you can, so instead I lightly flattened the dough into a large circle before cutting it into 8 wedges. 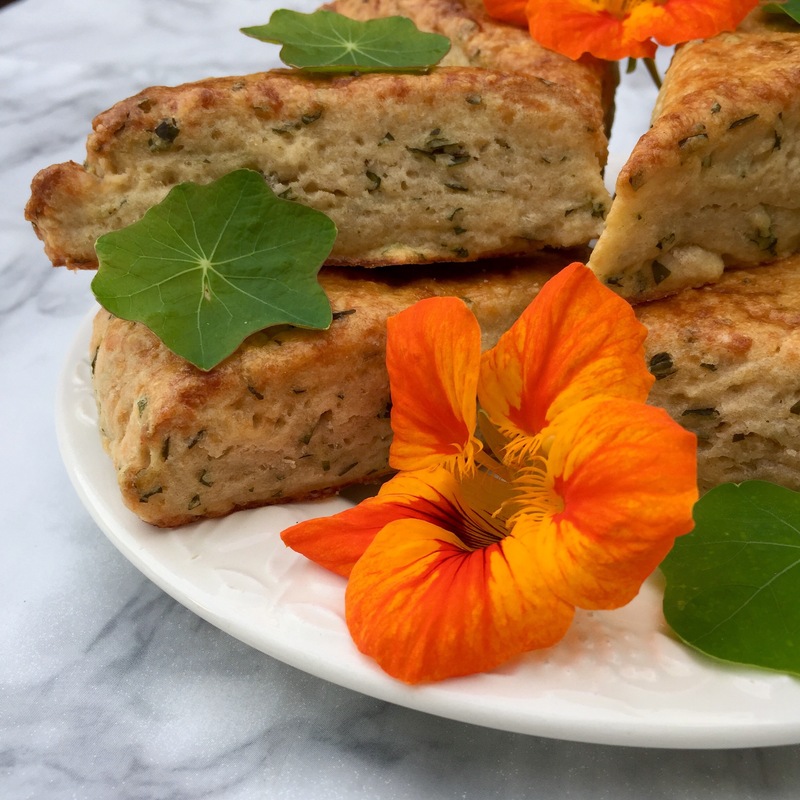 I love the chunky meal-full that you get with this method, especially for savoury scones. Mix the flour and salt to combine before grating in the cold butter. Rub the mixture together with your fingers until it starts to become crumble-like. Stir in the grated cheese and chopped nasturtium leaves. Gradually mix in the milk and water until the dough starts to come away from the edge of the bowl and form a ball. Tip the dough on to a lightly floured surface and cut into about 8 wedge-shaped portions. Place them on a baking tray (close together so they rise instead of spread), brush the tops with egg beaten with a dash of milk, and bake for 15 minutes. Take them out of the oven when golden, and serve warm with butter.